Keeping the old timber Baltagi’s house going was an increasing struggle. After eight years, in 1856, Canning complained about the unsightly old factory buildings that had never been demolished and he thought the best answer would be to build a new summer residence on their site. Sir Henry Bulwer, who succeeded Canning, suggested in 1863 that the whole site ‘would probably sell at a very high price and the Porte to whom I have spoken on the subject would be perfectly willing under such circumstances that it should be sold’. He thought that either something better could be bought with the proceeds of sale or part of the property could be sold to raise enough money to build a new residence on the retained part. The Treasury was not tempted and called for an architect’s report on the present buildings. This was commissioned from local architect George Stampa: he estimated that the buildings would require expenditure of about £1,500 to put right but thought it might be better to build afresh. In January 1866, a Major Edward Gordon was appointed as the superintendent of British government buildings in Constantinople, reporting direct to the Treasury and not to the Office of Works. 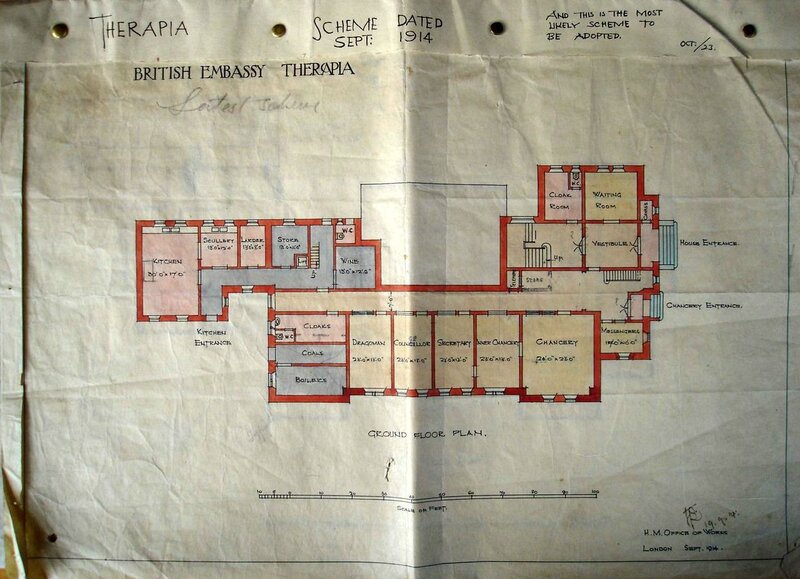 Asked for his own advice on the future of the Therapia buildings, Gordon observed that ‘In front of the Ambassador’s dwelling are the most unsightly ruins of a factory, which add greatly to the general air of desolation pervading the whole of this property …’. He concluded ‘To speak plainly and in a few words, I should say that the work most urgently required is an entire New Embassy’. He estimated that it would cost about £14,000 and he included this sum in his annual Estimates bid for 1867, strenuously supported by the newly-arrived ambassador, Henry Elliot. The Treasury agreed to proceed, and was content to leave all design aspects to Elliot, within a maximum of £10,000 and subject to approval by the Foreign Secretary and the Treasury. It is unclear who was responsible for the design of the new summer residence. 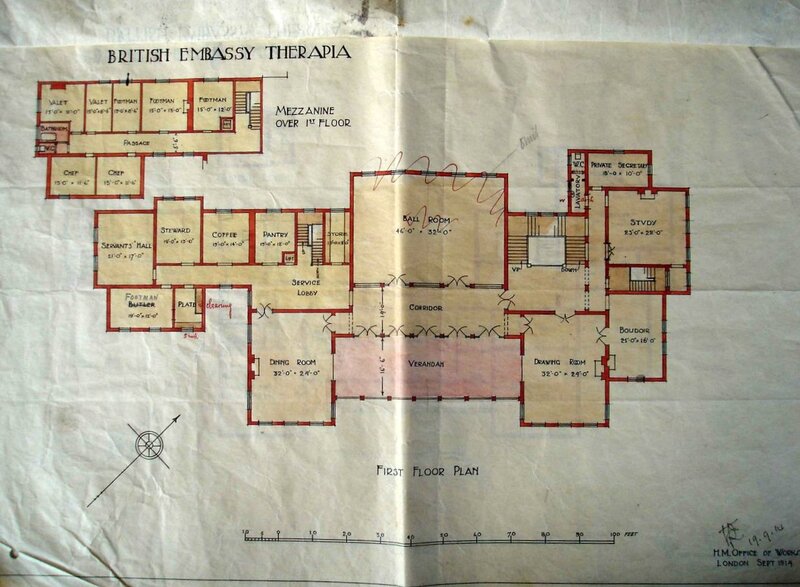 Gordon initially asked a London architect, E J Eardley Mare of King’s Road, Chelsea, to prepare a set of plans. Mare’s scheme was approved in London. Elliot, however, found fault with it and asked George Stampa to produce something more to his liking. The drawings that Elliot sent to London in August 1868 were credited to George Stampa, who was paid 5 per cent plus expenses to act as architect, but the extent to which he had retained or departed from Mare’s scheme is unclear because Mare’s original drawings have not been found. Mare discovered three years later that he was not to be paid for his design because Gordon’s commissioning letter had clearly stated that no fee would be payable if the scheme was not accepted. Mare argued in vain to the Foreign Secretary that, as his plans had been approved and submitted to Parliament, he was entitled to the usual commission of 2½ per cent. In any event, the resulting design, by whomsoever, was an attractive architectural solution. It was a fanciful Victorian mansion rising in parts to four floors, with a ground floor of vaulted brickwork supporting a timber superstructure, the facades painted grey with green shutters. The whole was attached to a hillside terrace via a grand octagonal entrance hall and bridge at first floor level. The hillside terrace was an adaptation of the former factory magazines and within their brick barrel vaults, two of which spanned natural calciferous springs, were the stores, kitchens and offices serving the new residence. The ground floor contained the main entrance, servants quarters, and chancery at the north end with its own stair up to the ambassador’s study on the floor above. The first floor had the reception rooms served by broad corridors and the double height octagonal entrance hall with its bridge to the garden terrace. The second floor contained all the sleeping accommodation. The hillside terrace extended northwards to Baltagi’s house. This was refurbished in 1871 to become the new Secretaries’ house. Its hipped-roof and flat front were replaced by a projecting first floor and pedimented front, in prevailing yali fashion. Hanson’s house was demolished but the ground floor stone enclosure of the former kitchen outbuilding was retained as garden staff accommodation. As the local roads became more serviceable, there grew a need for stables and coach houses. The Red House and associated outbuildings were cleared and a stable for seven horses, with three rooms above, built in its place in 1872. A new kitchen and stores building was erected for the residence on the site of the former kitchens: this is now the overgrown ruin that stands today near to the clubhouse and close to the garden terrace retaining wall. The north garden terrace survives beside the north boundary wall, with a vaulted storage area below. In 1881, the ambassador, Lord Dufferin, sought to build a Protestant chapel at the summer residence, capable of seating about 180 people. Boyce was invited to comment: he thought that ‘the probable occasional presence of a second gun vessel at Therapia is not, I submit, a sufficient reason for enlarging the Chapel accommodation. A very good chapel can be improvised on the quarter deck of a man-of-war’. The Treasury, however, was minded to be more helpful and contributed £290; private subscription raised £230; and Dufferin guaranteed the balance of about £220. A chapel was duly built ‘of very perishable material’ just to the north of the residence and its maintenance costs were shared by the Office of Works and the congregation. 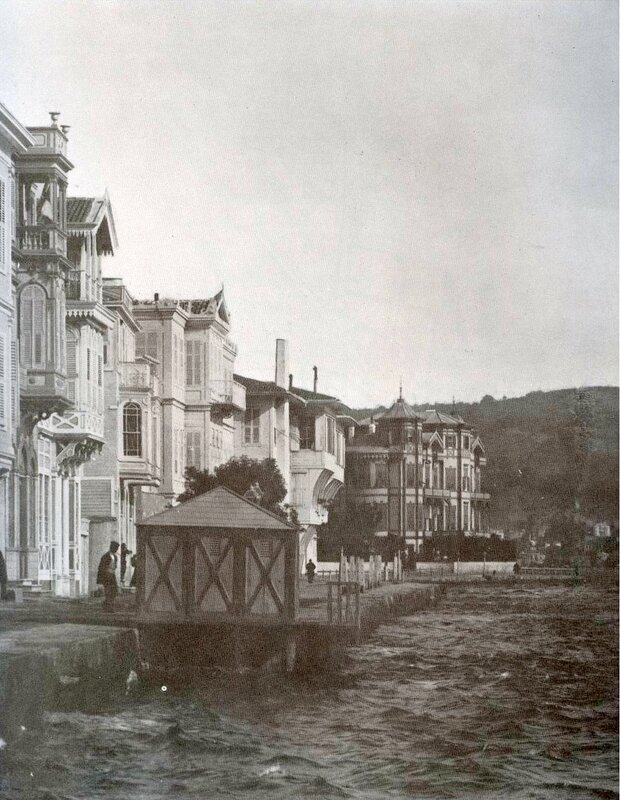 In 1888, as traffic on the waterfront roadway increased, the embassies were required to cede strips of land to the authorities to enable the quay to be widened. Some boats remained in use, however, so the road had to cross, on arches, the inlets that connected the sea with the boathouses. 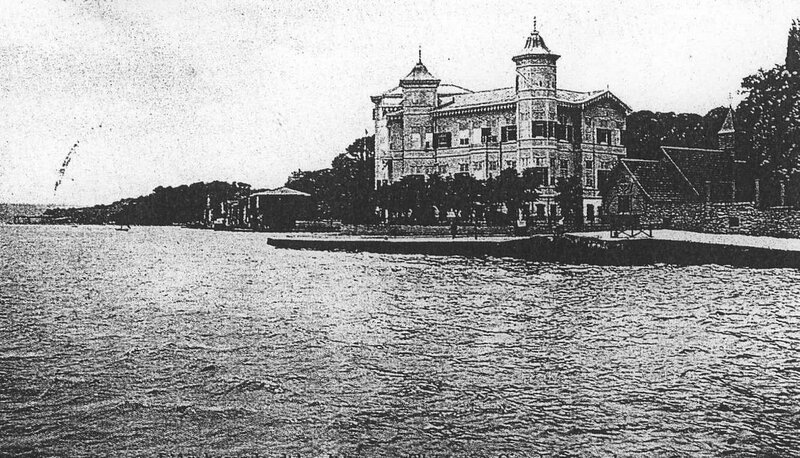 The summer residence from the sea. View of summer residence from the south. 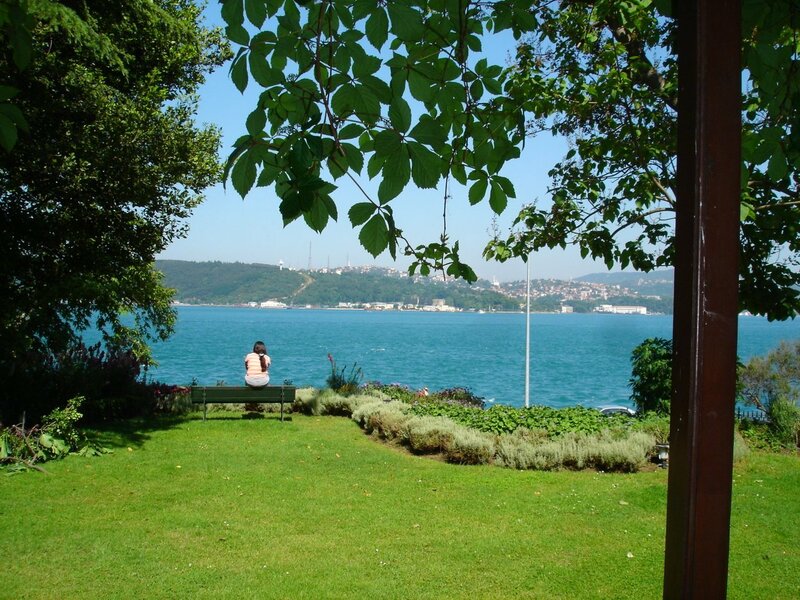 View northwards up the Bosphorus from summer residence, with the Secretaries’ house in the foreground. View north along Therapia village waterfront, with summer residence beyond. Summer residence from the south. Summer residence from the north-east. 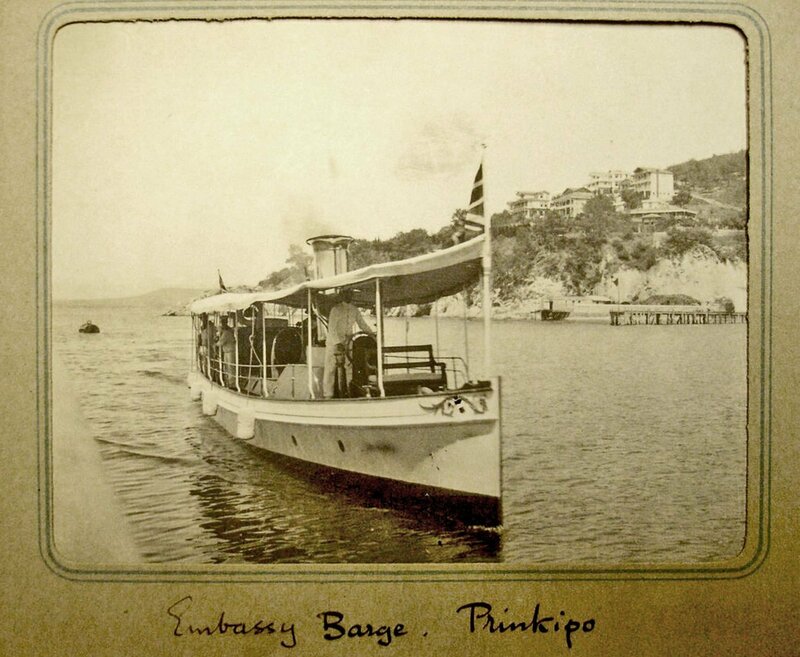 The embassy barge in 1907. 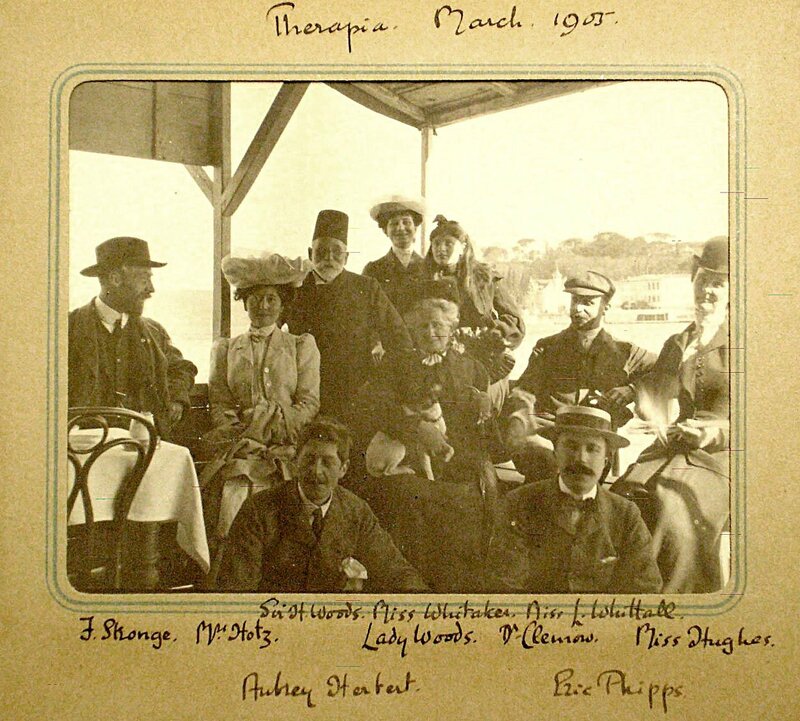 The summer residence burned down on 13 December 1911, allegedly as a result of a spark from a passing steamer but more probably of a domestic accident or oversight. Its reconstruction on the same site was ruled out and Earle, Secretary of the Office of Works, who visited the site in spring 1914, concluded that a new house would be better sited half-way up the steep hillside. Thrift Reavell, an architect in the Office of Works, produced some rather banal designs for a wide three storey house, complete with ballroom, lying along the contours about ten metres below the level of the obelisk. It might have been really splendid, with a huge veranda looking up and down the Bosphorus. The outbreak of war, however, put a stop to that project and, after it, the days of summer residences were nearing their end and the prospect of a new one faded away. The old Baltagi’s house, occupied by the Secretaries, was completely destroyed in a fire in February 1922 and nothing was built in its place. In the mid-1930s, the municipal authorities exercised their right to force the cession of land for further road-widening purposes beside the Bosphorus, in exchange for which they bore the expense of constructing a new boundary wall. The road widening also required repairs to the arches over the inlets to the boathouses, as well as the demolition of the chapel. This was not a serious loss: the congregation had disappeared by 1920 and in 1927 the Treasury had withdrawn its sanction for public money to be spent on the building. A bungalow was constructed elsewhere as a site and security office, which later became something of a perk for the Ministry of Works resident architect, but was also used by others. This building, subsequently enlarged, became available for staff from Ankara to hire for holidays, and known as Ankara Cottage. A tented camp was established on the Therapia site during the Second World War for Services personnel to take short leaves. During the war, also, a Dr Zakar acquired the adjacent site on the north side, which had a building referred to as the Egyptian Hotel on it. 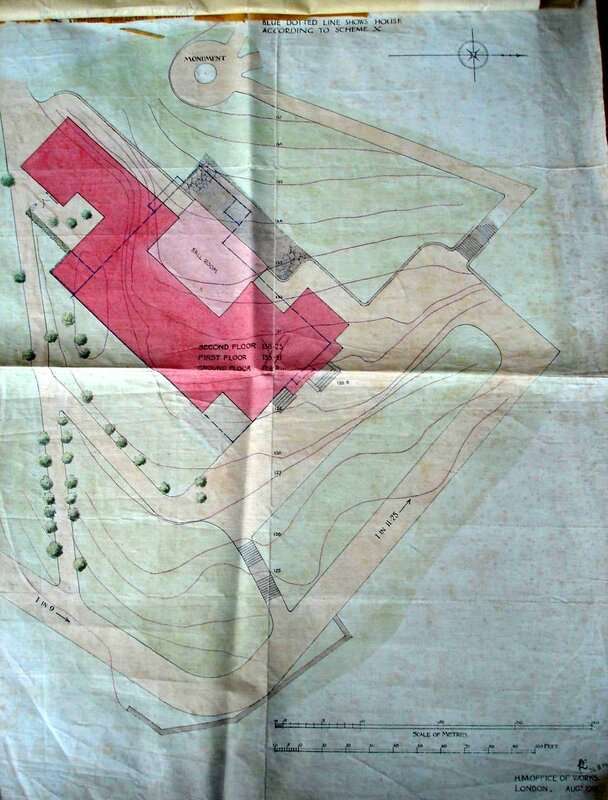 He also took possession of, and registered in his own name, the top terrace behind the former Attaches’ house: this properly belonged to the British summer residence site but nobody noticed the incursion. Zakar subsequently redeveloped the Egyptian Hotel site as a four-storey apartment building. 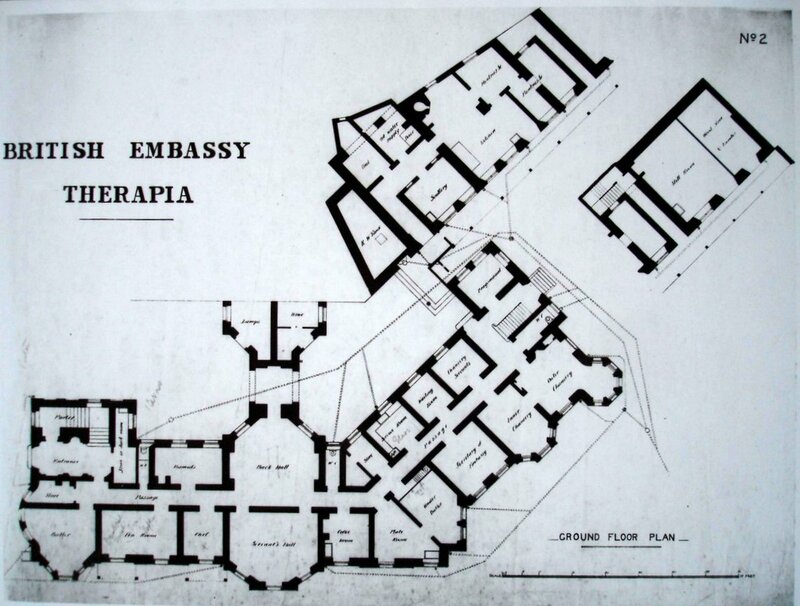 A permanent ‘country cottage’ was proposed for the Therapia site by the ambassador in 1945. Howard Jones, a senior architect in the Ministry of Works, said in February 1947 ‘It is a really lovely spot and far too good to be treated as a site for isolated structures… it should be done properly as a comprehensive architectural scheme’. 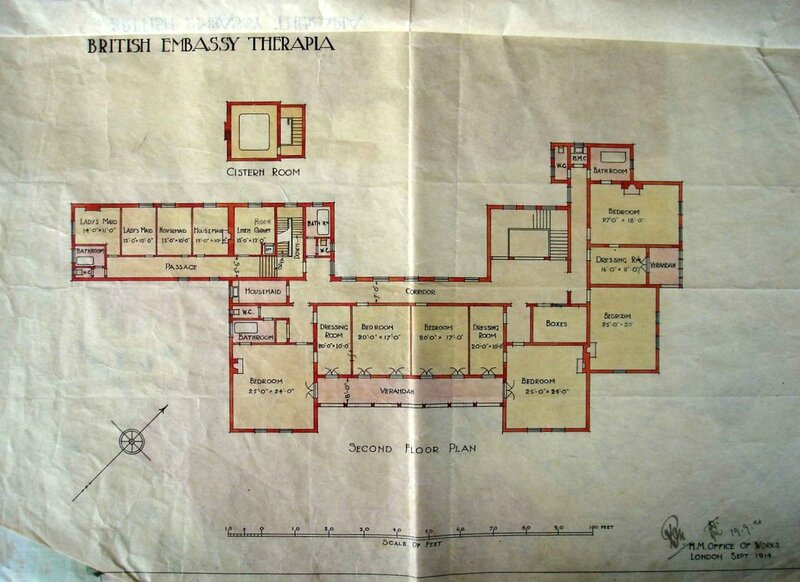 In 1947, Richard Turner, the Ministry’s senior architect in Cairo, was recommending building UK residential accommodation at Therapia. 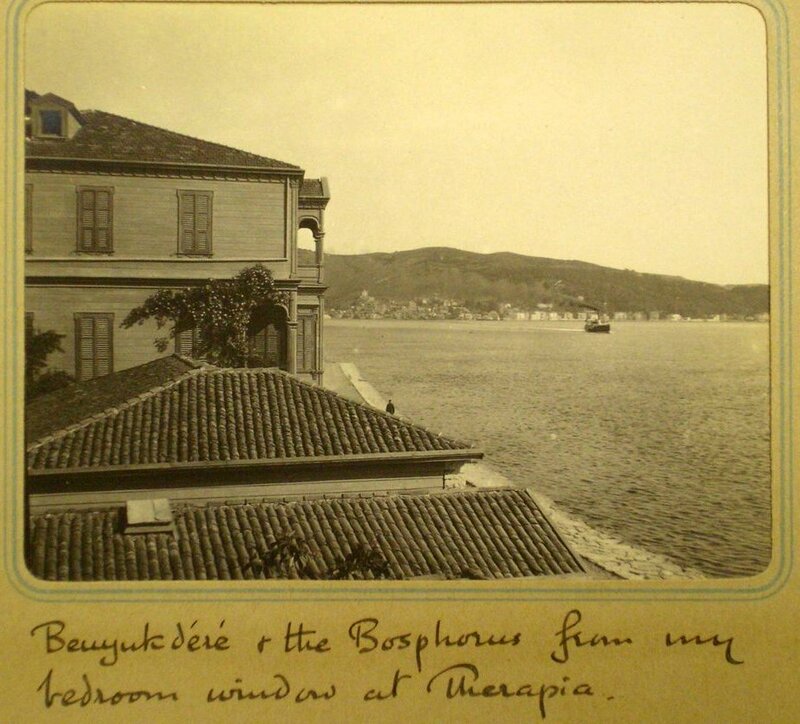 The disposal of Tarabya (as it was becoming more commonly spelled) was considered at intervals. Muir, Permanent Secretary of the Ministry, and Turner visited the site in October 1954. Muir concluded that it should be exchanged for land at Ankara. 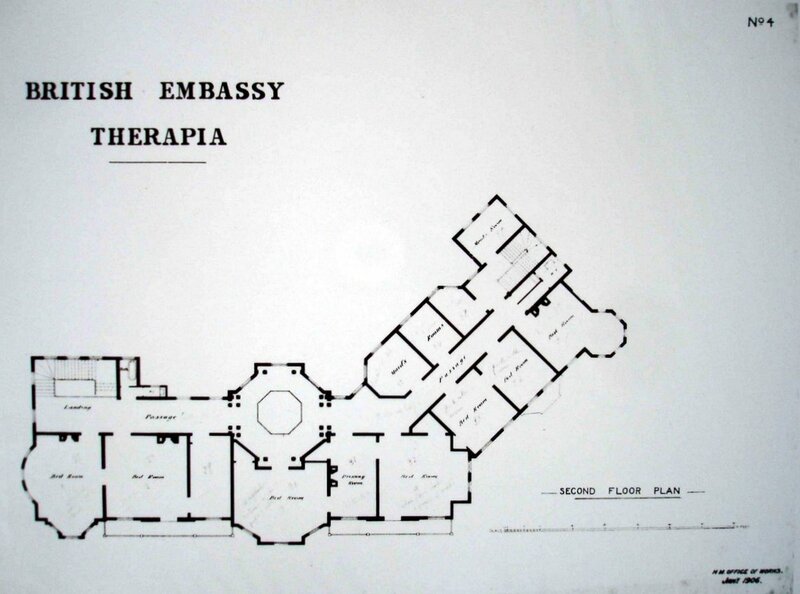 A Foreign Office report of November 1957 pointed out that Pera House, as well as being the consul general’s residence, was also the ambassador’s summer residence. ‘We were asked to consider what use could be made of the site at Therapia … we were unable to see any practical use which could be made of the site … without a disproportionate expenditure of funds … we recommend that we should now set about disposing of it as profitably as we can’. The former stables and apartment above, built on the site of the original Red house, were converted in the 1960s into a clubhouse, with gardener’s accommodation above. It remains the clubhouse. In 1978, the site was offered for sale to the Turkish authorities for a new presidential residence: in the event, they chose the Austrian site [and built?]. The Stone House, Coach House and former stables at the rear of the gardens were extensively refurbished as staff accommodation in the 1990s. The waterfront road was widened again, this time by projecting it on piles over the water, in the early 2000s. 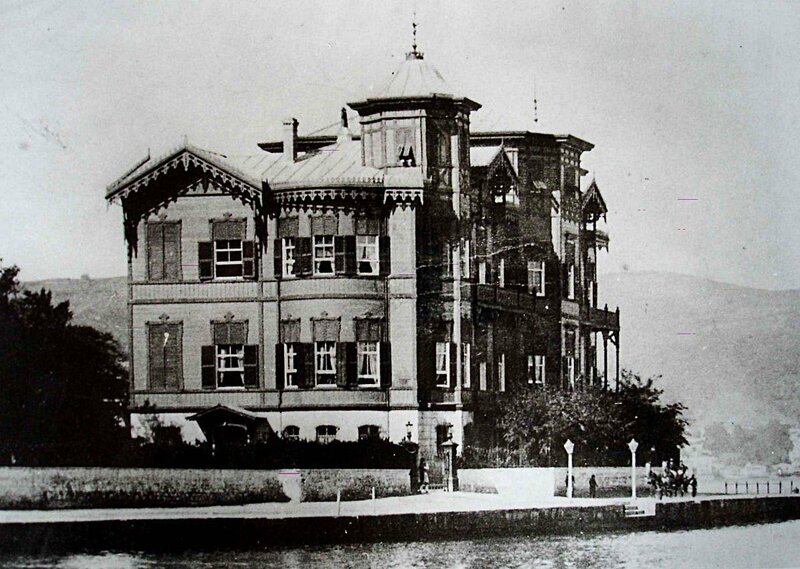 The Tarabya site was useful during the early-2000s for decanting from Pera House. 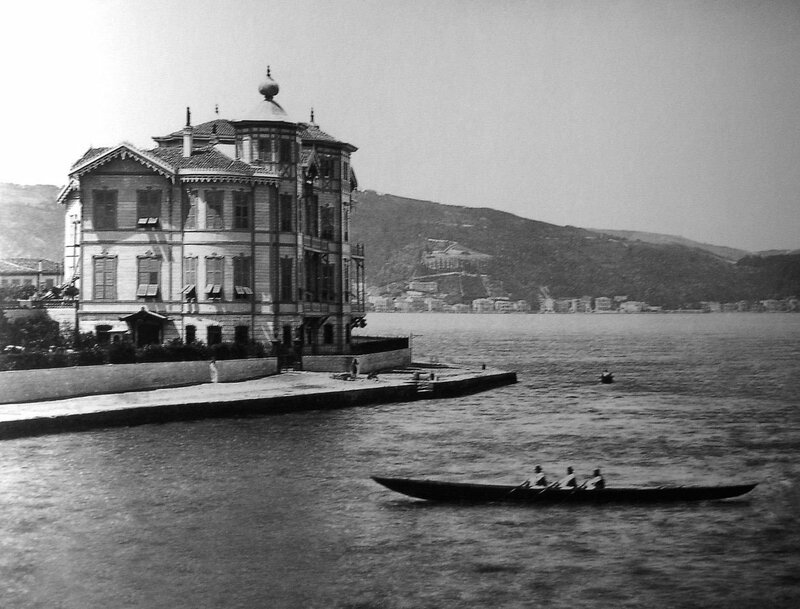 – Tarabya features in two of Harold Nicolson’s books: Sweet Waters, and Some People. – I am indebted to Mark Willingale for information about the occupation of the yalis before 1847. 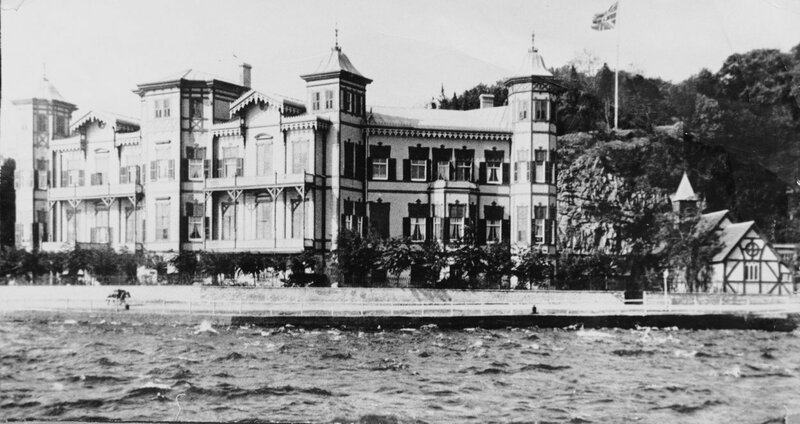 Proposed siting in 1914 of rebuilt summer residence. 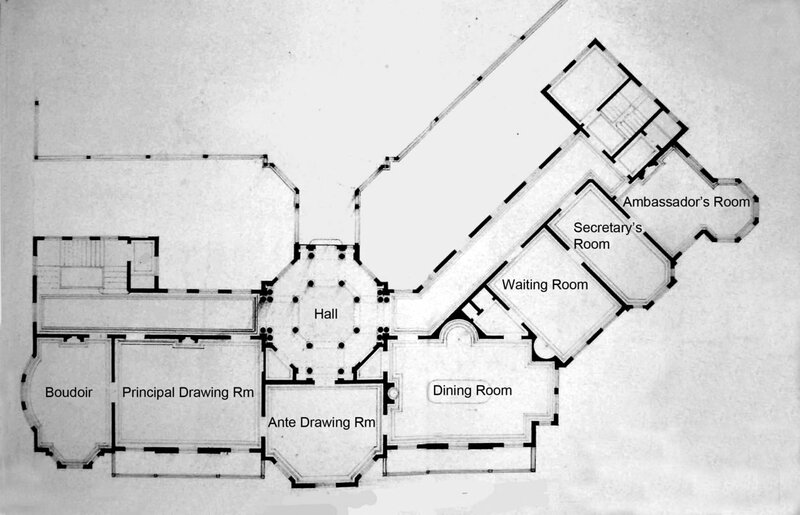 Proposed principal (first) floor plan, with ballroom and terrace. Proposed bedroom (second) floor plan. The site of the summer residence, 2005.